Over the last few days I've been revealing the features and benefits of the MCOVERAGE system option introduced in SAS V9.3. This system option creates a log file to show which lines of our macro(s) were executed, e.g. during our tests. Knowing that we tested all lines of code, or knowing that we tested 66% of all lines of code is important when judging whether we have tested sufficient amounts of our code to give sufficient confidence to put the new/updated system into production. This information relates back to our testing strategy (where we specified targets for the proportion of code lines tested). It also helps us spot dead lines of code, i.e. lines of code that will not ever be executed (perhaps due to redundant logic). Yesterday I showed code to read an mcoverage log file and create a table to show which macro lines had been executed and which had not. My code was basic and only worked for one execution of the tested macro. Quite often we need to run our code mor than once to test all branches through our logic, so today I'll discuss upgrading my mcoverage processing code so that it handles multiple executions of the tested macro. 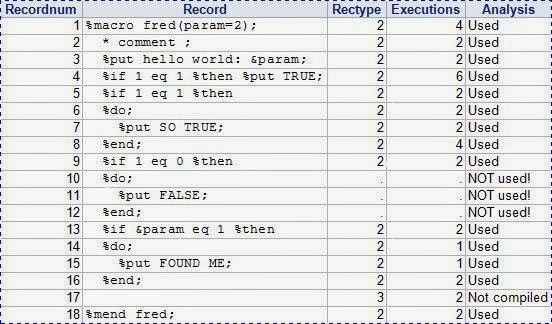 You will recall that type 1 records mark the beginning execution for a macro, type 3 records indicate non-compiled lines (such as blank lines), and type 2 records indicate executed lines of code. Note how we now get two type 1 records. These each mark the start of a new execution of the %fred macro. 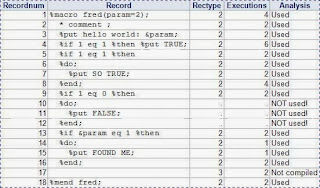 Close inspection of the type 2 records shows different sets of line numbers for the first and second executions, reflecting different paths through the %fred macro code. 10 %do; . . NOT used! 11 %put FALSE; . . NOT used! 12 %end; . . NOT used! So, we can see that executing the %fred macro with two different values for param has resulted in all but three lines of code being executed. We might choose to add additional tests in order to exercise the remaining lines, or a closer inspection might reveal that they are dead lines of code. I'll wrap-up this series tomorrow with a summary of what we learned plus some hints and tips on additional features that could be added. when 3 then "Not compiled"
when . then "NOT used!"